The crypto market has been dismal to say the least. Commentators even insist that this crypto winter has been the longest in seven years and even in the midst of this value wiping slide, Roger Ver—the face of Bitcoin Cash, is optimistic and very bullish on the space. Roger Ver is an ardent fan of cryptocurrencies and his hate for centralized entities is what keeps him going and advocating for Bitcoin Cash whom he claims to be the “real Bitcoin”. In a recent interview with Bloomberg, he said he invests because of fundamental reasons and that swinging prices is part of the fun. His bullish stance is because of the increasing adoption levels and regulator participation. But, even with the dismal performance of the market, Bitcoin Cash valuation has been halved and almost wrecked. Not only are prices registering new lows, but the creation of Bitcoin Cash SV is splitting miners and that could explain the drop in hash rates—down to 1 EH/s from around 7 EH/s. Everything else constant, this is not good for the overall health of the ecosystem as it might be prone to attacks now that there is increasing awareness and hackers are always on the look searching for vulnerabilities to exploit. Back to price action and BCH is down 22 percent in the last week. Thanks to losses of early this week, BCH is now trading below week ending Nov 25 lows of $150 and risk plummeting towards BCHSV levels assuming there are fundamental events that will catalyze losses. From the look of things, we expect BCH to be under pressure and before we suggest longs, there must be strong evidence from the chart and the first thing that must happen is a rally above $280 reversing Week ending Nov 25 losses printing at the back of strong bull volumes. Once that print, then BCH could edge towards pre-hard fork levels of $400. Otherwise at current state, sellers are in firmly in control as long as BCH trade below $150. For conservative traders, every high is technically a liquidation level. 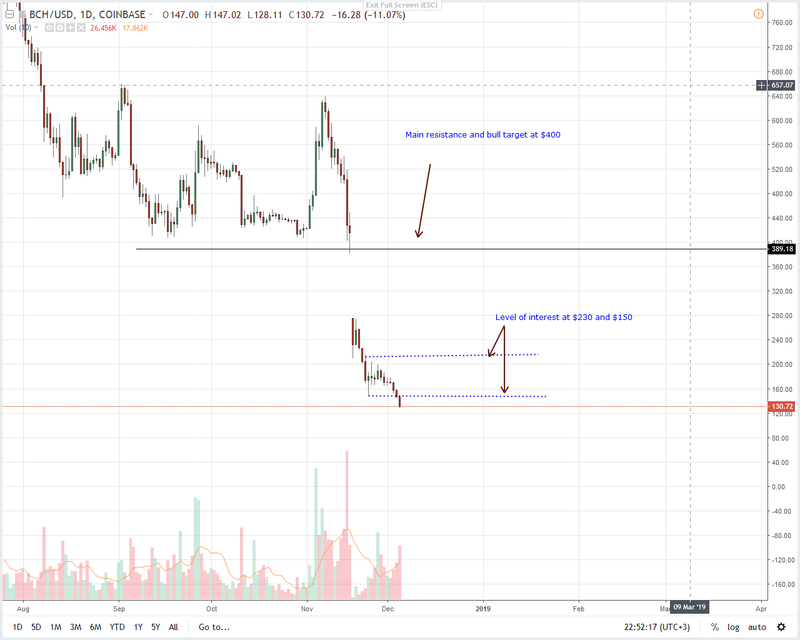 Here, BCH appears to have found support at $140 but since the path of least resistance is clear, we shall maintain a bearish outlook as we trade in line with our previous BCH/USD trade plan. Ideally, every high retesting $150 should be a selling point but assuming prices edge past $150 and above Nov 24 highs of $220 supported by volume spikes, then we shall reconsider our position and buy on every retrace with first targets at $280 and later $400. This will be so because bulls would have confirmed the three-bar bull reversal pattern, the Morning Star set in motion by Nov 25 and completed by Nov 28 bulls. Fitting stops shall be at $180. 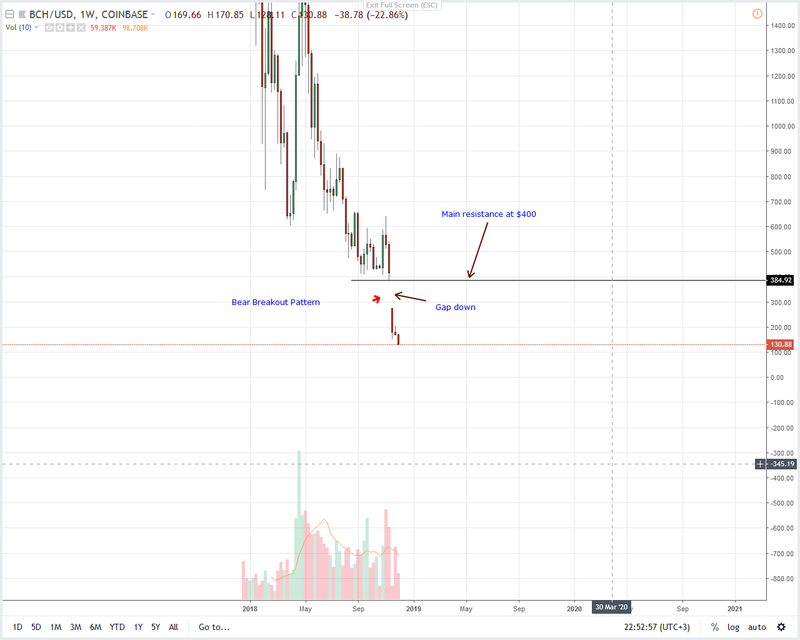 The post Bitcoin Cash Price Analysis: Path to Bitcoin Cash ABC—SV Parity? appeared first on NewsBTC.